Wednesday evening before Family Day, meet with other family members who have been through 13-weeks of boot camp with you at the Official MARINE Family Meet and Greet held at the Bayview Restaurant at the Depot. Advance reservations required in order to place your name on the security list at the front Gate entrance of the Depot. Once your recruit has completed The Crucible during training week 11 (the twelfth week of boot camp), you recruit is a MARINE! The Drill Instructors would like to celebrate with you during a dinner and Meet and Greet at the Beautiful Bayview Restaurant. 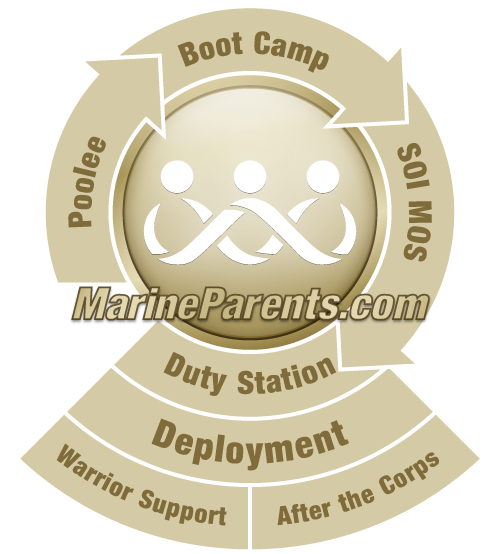 Beginning with the May 2015 graduations, the Official MARINE Family Meet and Greet will be held at the Bayview Restuarant at the Marine Corps Recruit Depot in San Diego. On the Wednesday evening before Family Day, join other newly-minted Marine Family Members for dinner on the Depot. You'll have opportunities to talk with family members that have been through 13-weeks of boot camp with you and relax on the Bay! Drill Instructors will be invited and may attend depending on training and/or personal schedules. Your recruit will NOT attend this dinner. A guest speaker will also be invited to each dinner and will be announced as plans are firmed up for each graduation week. This event is being planned and hosted by MCCS (Marine Corps Community Services) of MCRD San Diego. MCCS is the official support organization of the Marine Corps offering support services at every Marine Corps installation around the world. No fundraisers will be held in support of this event. The event will be from 5:00-8:00 p.m. (1700-2000) with dinner starting at 6:00 (1800). Each guest will be responsible for payment of their own dinner. Advance reservations are required in order to place your name on the security list at the front Gate of the Recruit Depot. Additional information and instructions for registration will be forthcoming. Beginning with May 2015 graduations, the Official MARINE family Meet and Greet will be held at the Bayview Restuarant at MCRD San Diego. meet with other family members who have been through 13-weeks of boot camp with you and meet the families that have gone through 13-weeks of boot camp with you.